You know how sometimes you just need some chocolate to make the world right again? Do you ever go to grab some chocolate and instantely feel guilty? If you can relate, I am going to let you in on a little secret that has solved this problem for me. 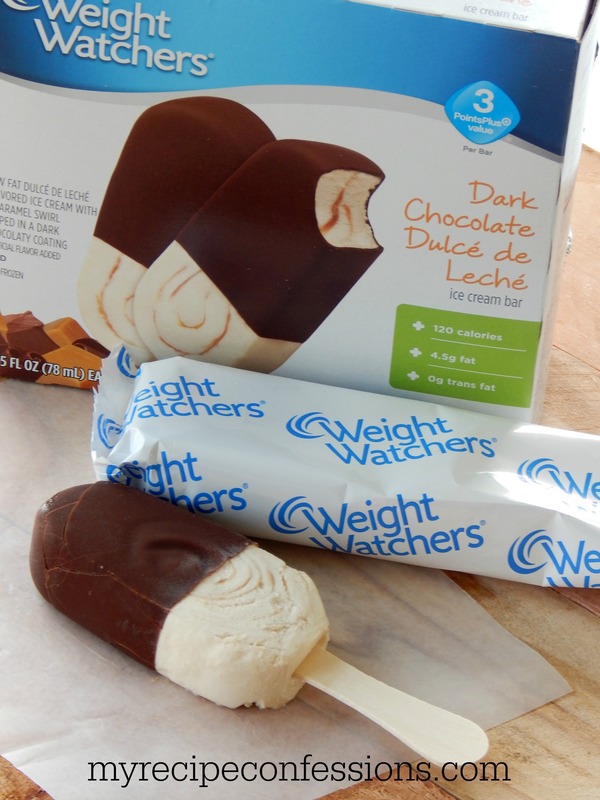 It is called Weight Watchers Dark Chocolate Dulce De Leche Ice Cream Bars. My mom is from Argentina and we grew up eating dulce de leche. The dulce de leche they have in these ice cream bars is the best dulce de leche I have ever tasted in a ice cream! I truly believe that Weight Watchers has angels in their warehouse making these ice cream bars! I mean come on, how else are they going to make these ice cream bars taste so amazing with only 110 calories. That is crazy! Weight Watchers does a pretty good job in making appetizing food. I have always loved their Raspberry Dark Chocolate Ice Cream bars with only 80 calories. However, I think they have taken things to a whole new level with the Dark Chocolate Dulce De Leche Bars! I bought mine at Walmart for around $4.00 for a box of six. That is less than $1.00 a bar, and it is worth every penny! Don’t just take my word for it. Give these heaven sent ice cream bars a try!